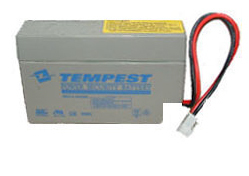 12 volt, 0.8 Ah for Medical applications, and general purposes. The special terminals is attached by wires, and can be viewed by linking to the product specifications. Length 3.78", Width 0.98", Height 2.40" (Total Height 2.40", Cable length 6.5", Special terminals, Approx Weight 1 lb.